How Can You Make Money by Developing a Mobile App? Every businessperson is here to make money online. To fulfill this purpose, every entrepreneur tries different business opportunities to earn money online and finally settle for the best long-run profitable project. Some provide web/ mobile services; few build smart web tools to achieve their desired goals. If you are wondering how to make money from apps, then you should read this blog. This blog will provide you with some facts & tips to develop money making apps. The average Americans spend 5 hours a day on their phones. Be it scrolling through their social media newsfeed, throwing out poke balls or streaming music, this alarming amount of time is a huge opportunity for app developers. According to the global market report, global mobile app revenue will reach $100 billion by 2020 from $75.8 billion (current). 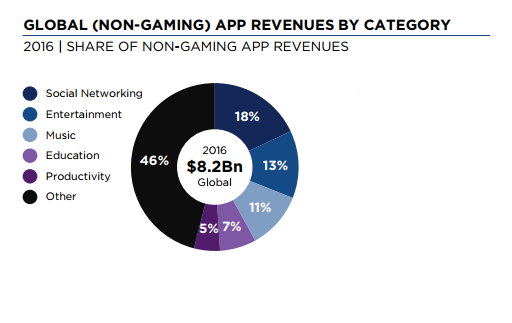 App revenues were just $8 billion in 2011 and grew to an estimated $45 billion in 2015 marking an increase of over 500%. 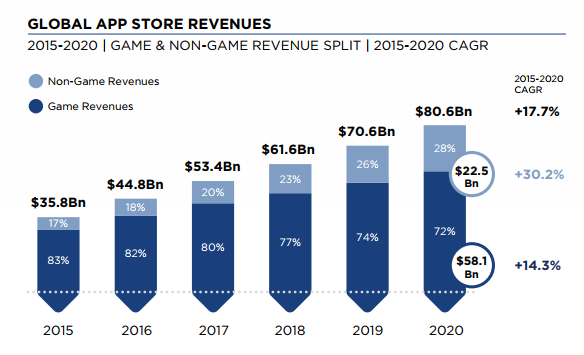 And according to these projections, app store gross revenue could hit $100 billion in 2020. Some industry insiders even expect revenues to surpass $100 billion by 2020. And if we go on to know the revenue generated by iOS versus revenue generated by Android, Apple’s App Store makes almost double the revenue of the Google Play Store. Despite the fact that most of the app users download apps from google play store, it seems that App Store users are more likely to pay for apps. According to Statista, the advertisement revenue had gone to 14% in 2017 from 6% in 2011. 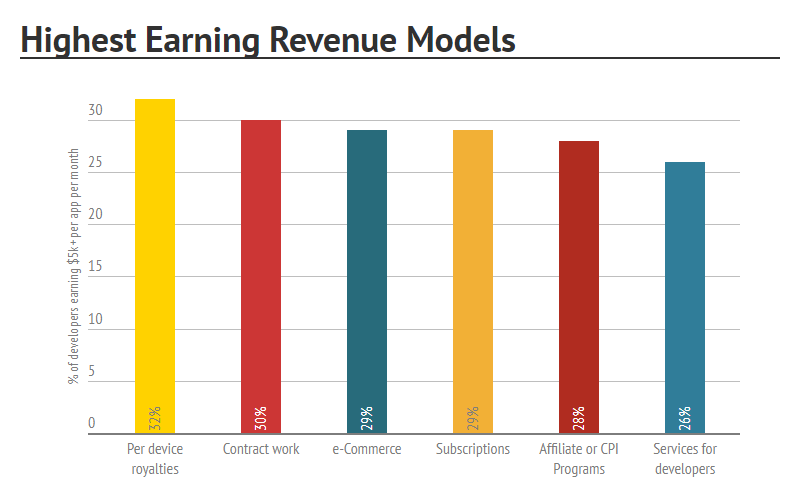 The paid app revenue percentage has gone down from 86% in 2011 to 36% in 2017. Here in-app revenue has marked the fastest growth, going from only 9% of revenue in 2011 to 48% in 2017. In the digitally influenced world, mobile application development is growing at a tremendous rate. Thus, in this scenario “how to make money from mobile apps” is the most fascinating question. While beginning with money making app development there comes a common question to every mind that should we start developing a free app or a paid app? Even though the free app will get us more downloads, how will it benefit us? Are In app purchases more beneficial or low priced mobile apps? Even though the free app will get us more downloads, how will it benefit us? Are In-app purchases more beneficial or low priced mobile apps? Let’s understand the differences which will help you to make the decision. This is something we all are aware of, in app ads. Ad networks like AdMob, iAds, are offered by Google and Apple, respectively. But yes, high traffic and a lot of downloads will be required to make a good profit from your free app offering. Sometimes mobile apps come in free and premium paired version. To download the premium version of an app a user has to pay a one-time fee to upgrade to the premium app offering for better features. When a free app is created, it contains a link attracting the users to try out added features. If you click on the link, you will be redirected to the app store where you can purchase the premium app. A lot of free apps are demo apps. The users download the free app, and the application is just enticing enough to get the user to buy the paid version. This turns out to be a real success when the user decides to pay and download the full version of a free app. The free version should have enough features to make the user believe that they cannot sleep without buying the premium version; therefore, we offer this free and premium deal. It’s just like a 14 days trial of an online tool. The key here is not to provide all the best features in the free-based offering, give them a chance to explore more by paying some amount for their interest. Ads can also work better in this case. There are many apps on app store and play store which promise to eliminate the ad support feature on up-gradation of the app. So yes, your free version can earn from ads and users can get rid of those ads by purchasing the premium version. Pairing up a free and a premium app is one of the marketing strategies where a user can be tempted with freebies. It is like a stepping-stone toward getting the same app users to go premium. It has been identified that offering an app at a low price allow you to make less money. Free apps with in-app purchase can be fun to use as most of the mobile games ask you to buy stuff within the games, and we are convinced to buy them due to our rewarded relationship with the app. Cost per Install Networks is new to the industry. You have to pay to a third party for every time your app is downloaded. The average fee is between $ 0.80 and $3.00. This method is some what very convenient for developers and drives consistent profit. Premium apps get you assured money, but it gets challenging to attract users to buy the app. On the other hand, making money online from free apps is possible, but it takes some efforts. Free apps earn money with aggressive marketing and innovative advertising. With the use of CPI solutions, advertising networks, in-app purchase offerings, ad-supported options, the marketability of the app will lead to greater profits. What’s the Future of App Development? There are never ending opportunities for fortune companies in the app market. The app market has been growing since day 1, and it has no plans of slowing down. Over 18% of android app developers earn over $5,000 per month, and the same amount is earned by 25% of iOS app developers. Video game apps are making money in millions. Now, the growing market of smart TVs and emerging market in smart watches will expand the app business in the coming years. Hope this blog helps you to understand how to make money from apps and how beneficial are these mobile apps. To know more details on app development, you can get in touch with our expert App development team at TechAhead, Google’s preferred android partner and creator of 1500 + mobile apps for iOS, android, and windows.